2004 edition. A critique of emotional distress, depression, bipolar, schizophrenia and suicide. Irish best-seller in 2001, 2002 MIND (UK) Book of the Year Award shortlist. As a practising GP, Dr Terry Lynch was plagued by increasing doubts about his effectiveness in dealing with patients experiencing emotional distress. He no longer trusted the drugs handed out as routine treatment for so-called mental illnesses. Changes in his working practice and a training in psychotherapy culminated in the writing of his controversial and deeply felt book. Every year one million people take their own lives worldwide, and thirty million attempt suicide. Terry Lynch believes that suicide is a final act of avoidance, which in the context of the person’s life always makes sense. Drawing on his wide experience as a GP and counsellor and using real case histories, the book demonstrates the common sense, but sadly controversial, idea that personal contact is a better healer than drugs. Dr. William Glasser, American psychiatrist and author, founder of Choice Theory and Reality Therapy. 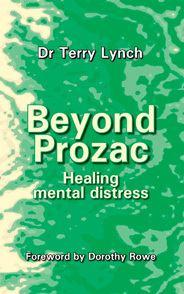 p. 260, on clinical tests for depression: “The GP Terry Lynch wrote (in Beyond Prozac):‘In twenty years of working as a doctor, I have never heard of any person having a diagnosis of depression, schizophrenia, manic depression or any other psychiatric condition confirmed by a blood test or any other test. Dosages of psychiatric drugs are not adjusted according to blood-test results, as happens with all biochemically based illnesses. When doctors decide to stop treatment in cases of ‘mental illness’, no blood test is done to confirm that the supposed biochemical abnormality has been eradicated. Why no tests? Because no such tests exist—because no biochemical abnormality has been demonstrated in any psychiatric illness. Manic depression is the only psychiatric condition where regular blood tests are carried out. These tests are not done to check the level of any body chemical. Rather, they are done to check the blood levels of the treatment drug lithium, a drug with highly toxic side effects’”. (Since I wrote Beyond Prozac, blood tests have become used to measure levels of other drugs, such as Epilim in bipolar and clozapine in schizophrenia. As with lithium, these blood tests are done not to identify underlying biochemical abnormalities—there are none—but to check drug levels in the bloodstream). “The single most important contribution to our understanding of suicide in the past ten years, a vital articulation of the unsayable” (Irish Times 2 July 2001). “A group of Japanese scientists…hypothesise that ‘very low but sustained lithium intake can prevent suicide in the general population’…here is medical science as an institution of social control, with the physicians as ‘biocrats’ subverting democracy by the sheer force of their ‘professionalism’. Has medicine become too professional, with ‘cases’ to be ‘fixed’ rather than help patients to be listened to and helped? Yesterday’s physician used to diagnose the sick; today’s biocrat decrees who should be treated, and mass treatment, such as dumping…stuff in the water, saves time. (George Winter, “The truth is hard to swallow”, Irish Medical News, 13th July, 2009).